With a triangular face shape the object is to narrow your chin and widen your forehead. A triangular face shape requires haircuts, styles and makeup that will flatter and help minimize the bottom-heavy appearance of its shape. Your face is longer than it is wider. Your jawline is wider than your forehead. Your chin is square and/or flat in shape. Your jawline is broad and strong. Your cheekbones are straight and taper from your jaw to your forehead. Your face is widest at your jawline. All of these characteristics add up to unique face shape which can be flattered with the right hairstyle and makeup choices. Layered hairstyles will help balance and soften your prominent jaw line. Styles with layers that taper at the jaw line can also be flattering. Shorter is generally better than longer. 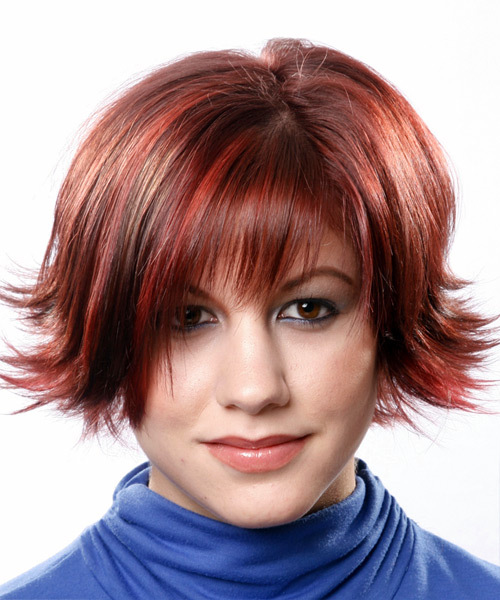 Avoid any hairstyle which will draw too much attention to your chin area such as straight solid bob cuts. 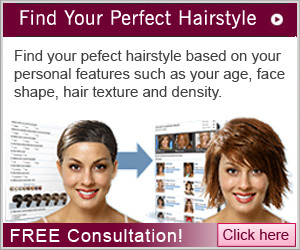 If you like any of the following hairstyles, click on each image for larger views, how to style steps and a try on link for the virtual hairstyle. This short layered hairstyle is perfect in how it puts hair exactly where it's needed to make a triangular face shape look balanced and proportional. The heavy top layers allow hair to be rounder and fuller above the ears, while no bangs make the face shape appear longer, bringing attention to the forehead and away from the jaw line. This short hairstyle is the perfect example of what doesn't suit triangular faces. For a start, the bangs are heavy forward falling and in the eyes. This makes the overall shape of the face appear to be shorter and wider. Worse still, due to the sides being layered in short, the jaw area actually appears larger and wider than it really is. The geometry is all wrong as our image shows very well. This is a very nice hairstyle shape which suits triangular face shapes to a tee. The sides fall softly onto and away from the jaw line creating cover in the right places, and the side swept bangs work well to create diagonal direction drawing attention to the eyes. The zig zag part creates some height and builds length into the look, while an all over rounded shape frames the face nicely. Too wide, too square! 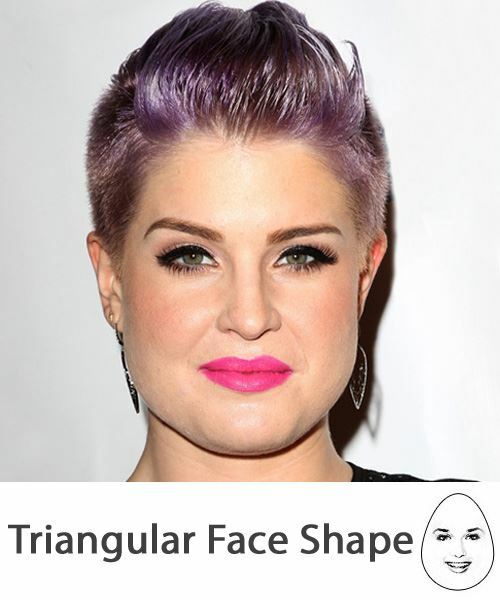 This hairstyle is the worst possible shape for triangular faces. The sides only make the jaw area, which is already large naturally, look even wider and bigger. The heavy bangs make the face shape appear even shorter and wider which leads the eye to the sides and width once more! The hairstyle follows the actual shape of a triangular face shape instead of compensating and adjusting it. This long soft wavy hairstyle is a nice look and a great example of how to design a hairstyle that will suit triangular face shapes. The soft waves have a naturally soft appearance that falls nicely due to the layering. The middle part also helps to top divide the face into two long narrow portions to create the illusion of length. This shape will work in straight and curly textures. Another good example of the wrong hairstyle on the wrong face shape! Triangular faces are pear shape and are narrowest at the top forehead region and widest at the jaw line chin area. This hairstyle follows that same shape. This style kicks out at the bottom and sides and only draws further attention to the jaw region, while the heavy bangs, although to the side, still make the face look shorter and wider. Bangs are perfect for adding versatility to your look and for giving your hair a makeover without sacrificing your length, but they can also make such an impact that they totally change the way you look. This is because the look, style and length of bangs have the ability to shape your face - for better or for worse. The lower half of triangular faces is very heavy and will benefit from bangs that draw attention from the bottom half of the face and focus it on the middle or top half of the face for the most flattering look. Side-swept bangs that allow most of your forehead to show through will keep attention on the top section of your face. Also, having some height to the bangs further opens up the forehead and draws attention away from a heavy jaw line. Light, wispy side-swept bangs will add some diagonal direction and draw attention to the eyes and the middle of the face and the lightness of the bangs will still allow part of your forehead to show through instead of blocking it out completely. Triangular face shapes have characteristics that can make them look wide and short so ensuring that you avoid bangs that encourage width and a short face length is the way to go. Full bangs that cover up the slimmest area of your face (your forehead) will put the largest part of your face shape (your wide jaw line) on show and should be avoided if you want to achieve a truly flattering look with bangs. Bangs that hang in the face and essentially cover up most of the top half of the face shape is not a good look for triangular faces as the only visible part of your face will be the wide jaw line area. By choosing the types of bangs that will give your triangular face shape a much more flattering look you can then give focus to the other features of your face, such as your eyes, really nicely shaped lips or your nose, so be sure to keep these types of bangs in mind when looking for the right bangs for you. To see if these bangs will suit you, click on the images for a link to try the virtual hairstyle on your own photo or our model. If you're after more options then visit our hairstyle categories for plenty of great bangs hairstyle ideas. Apply some dark eye shadow to your eyes to make a strong and dramatic statement and then add some gold highlighter up and out across to your eyebrow to increase width. Use a grey kohl pencil above your lashes starting from the middle of your eyelid to the outer corner, and all across the bottom lashes around your eye. Use a light colored blusher on just your cheekbones and take the color to your hairline to narrow down your face. Use a blush shade that is one tone darker than your foundation to blend a triangle shape from under your cheekbone to the points of your jaw. A dark colored lipstick will minimize width through the lower part of your face. For tips on shaping your lips, see our beauty article, Makeup Tricks: Shaping Your Lips. To see the difference lipstick can make to your face shape visit the extras section in our Virtual Hairstyler and try out our selection of lipsticks. When it comes to makeup, the number one rule is that you should always be comfortable. Use these tips and makeup color suggestions as a guide for creating your own look and remember that all face proportions are different and the aim is to balance your own individual features within your face shape.